A new 3D model of an explosion from the V745 Sco system is helping astronomers learn more about this volatile system. 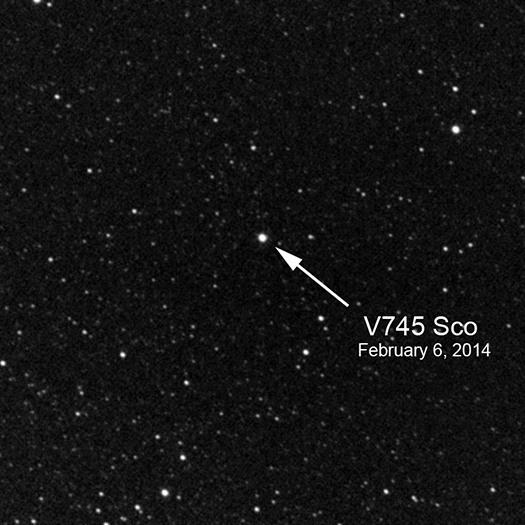 V745 Sco is a binary system where a red giant and a white dwarf star are in very close orbit around one another. The intense gravitational forces from the white dwarf pull the outer layers of the red giant onto the smaller star’s surface, triggering explosions. Astronomers observed V745 Sco about two weeks after its most recent outburst in 2014 with Chandra, enabling them to generate this new 3D model. 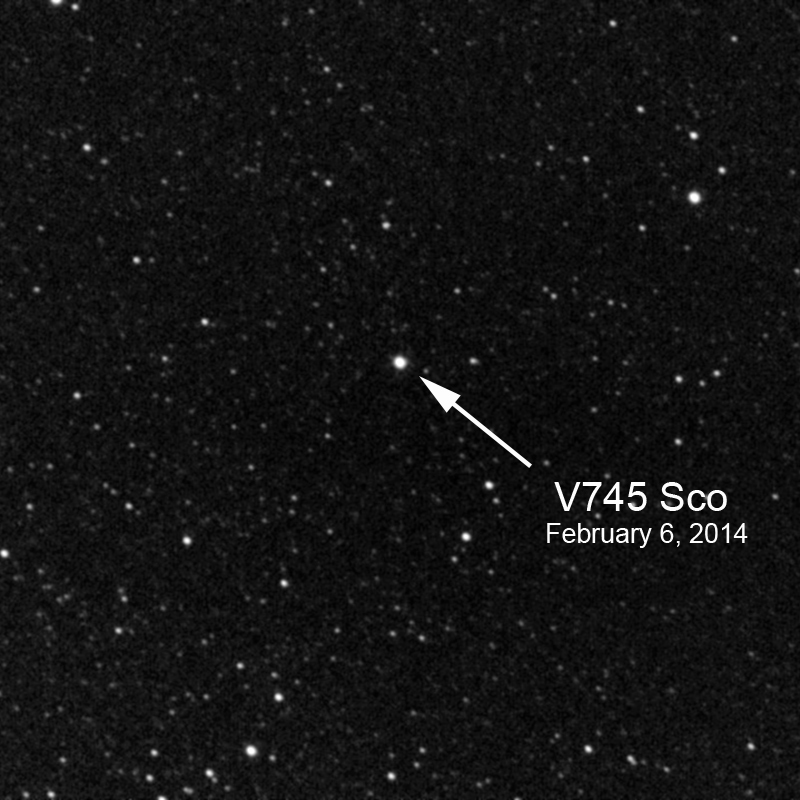 Astronomers observed V745 Sco with Chandra a little over two weeks after the 2014 outburst. Their key finding was it appeared that most of the material ejected by the explosion was moving towards us. To explain this, a team of scientists from the INAF-Osservatorio Astronomico di Palermo, the University of Palermo, and the Harvard-Smithsonian Center for Astrophysics constructed a three-dimensional (3D) computer model of the explosion, and adjusted the model until it explained the observations. In this model they included a large disk of cool gas around the equator of the binary caused by the white dwarf pulling on a wind of gas streaming away from the red giant. 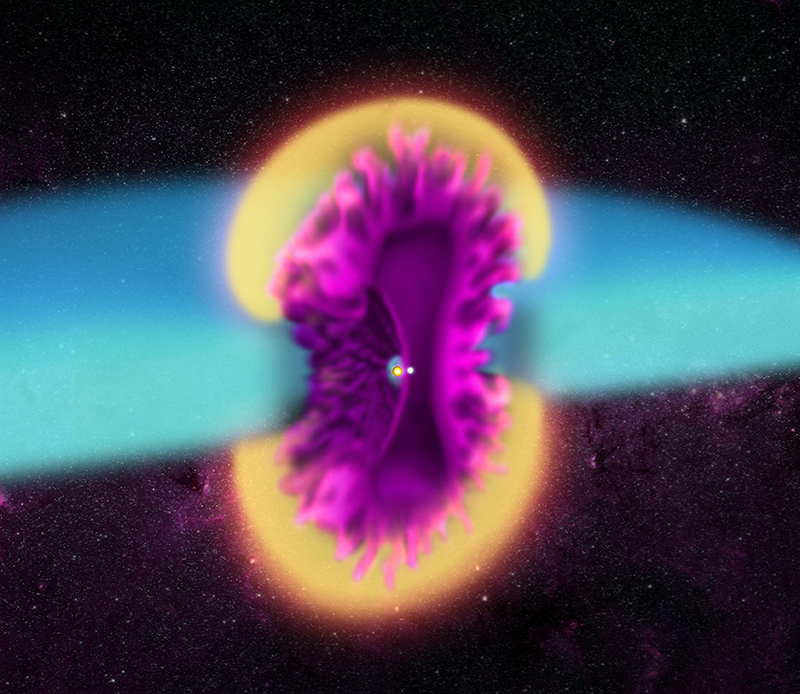 In the figure (pictured above) showing the new 3D model of the explosion, the blast wave is yellow, the mass ejected by the explosion is purple, and the disk of cooler material, which is mostly untouched by the effects of the blast wave, is blue. The cavity visible on the left side of the ejected material (see the labeled version) is the result of the debris from the white dwarf's surface being slowed down as it strikes the red giant. Below is an optical image from Siding Springs Observatory in Australia. A 3D print of the model was also created (pictured below). 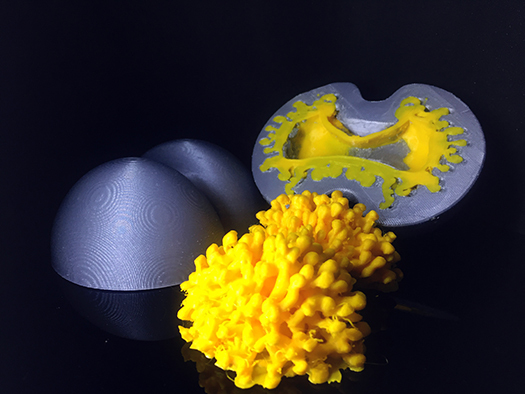 This 3D print was simplified and printed in two parts, the blast wave (shown here in grey) and the ejected material (shown here in yellow). Coordinates (J2000) RA 17h 55m 22.2s | Dec -33° 14´ 58.6"
A perfectly fitting example to the formation theory of matter and expansion scheme of universe. Supernovae are the centers of production of selected elements both visible and invisible matter and they appear and disappear as the expansion proceeds.